GREYEAGLE SSL RWD – 2018. Warehouse Courland UK Ltd Unit 4e Enterprise Court Farfield Park, Rotherham S63 5DB, South Yorkshire Company number: 10626943 VAT number: GB287347854. FULL AFTER SALE SERVICE. THE LISTING IS FOR. 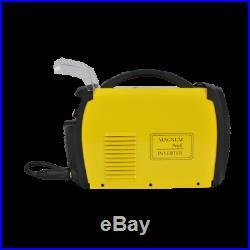 MAGNUM MIG 210 SYNERGIA EASY TIG MMA ARC 200A HF welder inverter synergic. Power: 230V / 50Hz. TIG LIFT function Yes. Welding without gas Yes. The reel weight used is 1-5 kg. Protection of the IP21 housing. The MAGNUM series is a professional synergic semi-automatic welding machine designed for manual, electric welding of low-carbon, low-alloy steel (MAG), alloy steel (MIG), aluminum alloys, etc. The device can also be LUTOSPAWA, MMA welding using hot-melt coated electrodes and the TIG Lift method. It is intended for all kinds of welding works, in locksmith workshops, repair workshops, industrial workshops, factories, etc. Thanks to the synergistic settings, the device is very easy to use and can be used by welders even with minimal experience. The power source has been built on IGBT transistors that ensure minimum electromagnetic interference, which allows to increase the efficiency and reliability of the power source, reduce energy consumption, and instantly adjust the current to changes in parameters during welding. Polish manual (English version might be available, please ask for it). 15kg (All kit around 17kg). With this option, you will receive Grey Eagle Shop’s bank details when creating an order. Safely pack item(s) in a unique bundling, including documentation, manuals, guarantee data, registration, and so on. We are not in charge of lost or harmed packages. On the off chance that you are not 100% fulfilled by your item, you can return or trade your request inside 30 days from the date of receipt. Safely package things as we are not in charge of any things lost or harmed in travel. Any item not in “sellable” condition. Future Changes We are fully entitled to change these terms whenever we wish to do so, the changes will be presented on this page, the landing page, and different areas we consider proper with the goal that you know about the set of accepted rules of our administration. We save and are qualified for all rights to adjust, modify, change or overhaul these terms at any given time, so please check back from time to time. Deliveries to Northern Ireland, Scotland, Channel Islands, and overseas might take longer, and might charge extra costs for this. Processing We take unprecedented measures to guarantee your things arrive securely and in place. CHECK MY OTHER ITEMS. Sign up for our newsletter!! 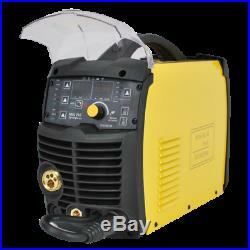 The item “MAGNUM MIG 210 SYNERGIA EASY TIG MMA ARC 200A HF welder inverter synergic” is in sale since Saturday, November 10, 2018. 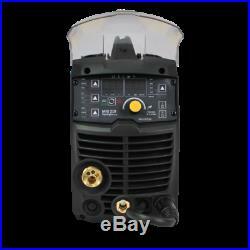 This item is in the category “Business, Office & Industrial\Metalworking/Milling/Welding\Welding & Soldering\Welding\Welders, Cutters & Torches\MIG Welders”. The seller is “greyeagleshopcouk” and is located in Heanor. This item can be shipped worldwide. 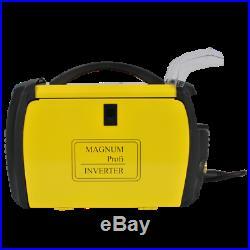 Inverter welder Magnum MIG 170. The device from the MAGNUM MIG-MMA 170 IGBT series is a professional welding semi-automatic designed for manual, electric welding of low-carbon, low-alloy steel (MAG), alloy steel (MIG) and aluminum and its alloys. The device can also be welded using the MMA method using hot-melt coated electrodes. It is intended for all kinds of welding works, in locksmith workshops, repair workshops, industrial workshops, factories, etc. The power source has been built on IGBT transistors that ensure minimum electromagnetic interference, which allows to increase the efficiency and reliability of the power source, reduce energy consumption, and instantly adjust the current to changes in parameters during welding. 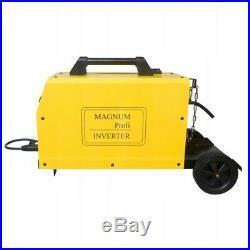 The Magnum MIG 170 can be used with the optional cylinder shelf or without. The assembly of the shelf takes only a few minutes. 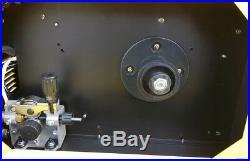 In this welding machine, you will mount spools of 1 or 5kg (D100 or D200). The device allows welding using methods. MIG (in the shield of inert gases – argon / carbon dioxide mix). MAG (in the shield of active gases – carbon dioxide). FCAW (core wire [powder] so-called FLUX). MMA (welding with coated electrode). Brazing (with CuSi3 wire in a pure argon shield). Degree of protection: IP21S. Weight: 14,7 kg. Power: 5.2 kW. Idle voltage: 56 V. Working current 60%: 160 A. Diameter of self-shield wire: 0.8 – 0.9. Diameter of steel wire: 0.6 – 0.8. Diameter of stainless steel wire: 0.6 – 0.8. 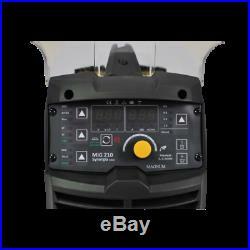 Welding current adjustment range: 30 – 160 A. Mains current: Nominal supply voltage 20 A: 230 V; 50Hz (1ph). MAGNUM MIG 170 device. Handle mounted permanently 2.2 m. Optional shelf for cylinder, wheels and cylinder chain. User manual in Polish. Packing and shopping process. Simply leaving negative or neutral feedback can’t solve the problem. We can provide also the invoices without VAT, if you have active European VAT number. We are Polish wholesale of welding, pneumatic and technical products all over the world. Our company data: PEMAT S. Przyjazni 48b/11 41-103, Siemianowice Slaskie, Poland VAT UE: PL6431768329. 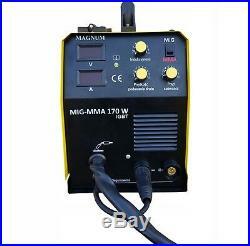 The item “Magnum MIG 170 ARC inverter inverted welder 160A MIG / MAG / MMA / FLUX /BRAZING” is in sale since Friday, October 12, 2018. 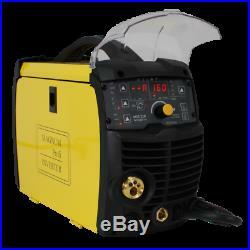 This item is in the category “Business, Office & Industrial\Metalworking/Milling/Welding\Welding & Soldering\Welding\Welders, Cutters & Torches\MIG Welders”. The seller is “pematshop” and is located in Piekary Slaskie. This item can be shipped worldwide. 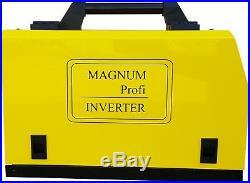 Inverter welder Magnum MIG 170. 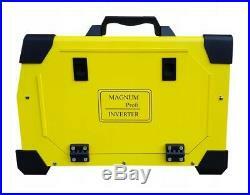 The device from the MAGNUM MIG-MMA 170 IGBT series is a professional welding semi-automatic designed for manual, electric welding of low-carbon, low-alloy steel (MAG), alloy steel (MIG) and aluminum and its alloys. The device can also be welded using the MMA method using hot-melt coated electrodes. 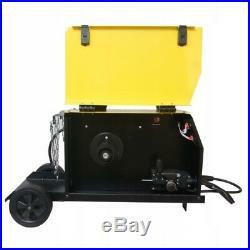 It is intended for all kinds of welding works, in locksmith workshops, repair workshops, industrial workshops, factories, etc. The power source has been built on IGBT transistors that ensure minimum electromagnetic interference, which allows to increase the efficiency and reliability of the power source, reduce energy consumption, and instantly adjust the current to changes in parameters during welding. 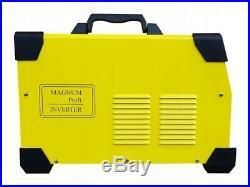 The Magnum MIG 170 can be used with the optional cylinder shelf or without. The assembly of the shelf takes only a few minutes. 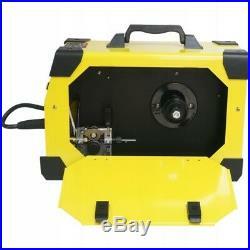 In this welding machine, you will mount spools of 1 or 5kg (D100 or D200). The device allows welding using methods. MIG (in the shield of inert gases – argon / carbon dioxide mix). MAG (in the shield of active gases – carbon dioxide). FCAW (core wire [powder] so-called FLUX). MMA (welding with coated electrode). Brazing (with CuSi3 wire in a pure argon shield). Degree of protection: IP21S. Weight: 14,7 kg. Power: 5.2 kW. Idle voltage: 56 V. Working current 60%: 160 A. Diameter of self-shield wire: 0.8 – 0.9. Diameter of steel wire: 0.6 – 0.8. Diameter of stainless steel wire: 0.6 – 0.8. 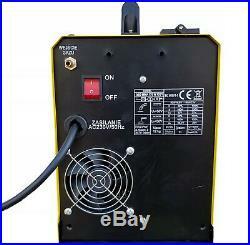 Welding current adjustment range: 30 – 160 A. Mains current: Nominal supply voltage 20 A: 230 V; 50Hz (1ph). MAGNUM MIG 170 device. 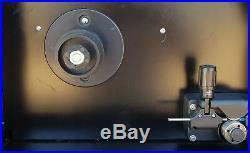 Handle mounted permanently 2.2 m. Optional shelf for cylinder, wheels and cylinder chain. User manual in Polish. Packing and shopping process. Simply leaving negative or neutral feedback can’t solve the problem. We can provide also the invoices without VAT, if you have active European VAT number. We are Polish wholesale of welding, pneumatic and technical products all over the world. Our company data: PEMAT S. Przyjazni 48b/11 41-103, Siemianowice Slaskie, Poland VAT UE: PL6431768329. 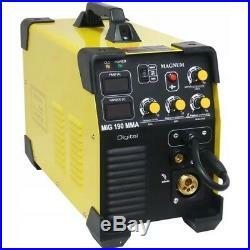 The item “Magnum MIG 170 ARC inverter inverted welder 160A MIG / MAG / MMA / FLUX /BRAZING” is in sale since Friday, October 12, 2018. This item is in the category “Firma i Przemys\Obróbka metali i lusarstwo\Spawanie i lutowanie\Spawanie\Spawarki i palniki\Spawarki MIG/MAG”. The seller is “pematshop” and is located in Siemianowice Slaskie. This item can be shipped worldwide. 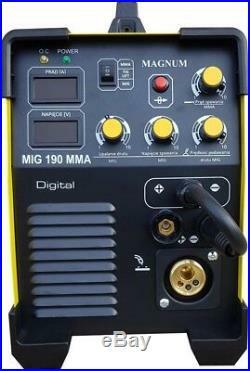 Inverter welder Magnum MIG 190. The MAGNUM series is a professional semi-automatic welding machine designed for manual, electric welding of low-carbon, low-alloy steel (MAG), alloy steel (MIG) and aluminum and its alloys. The device can also be welded using the MMA method using hot-melt coated electrodes. 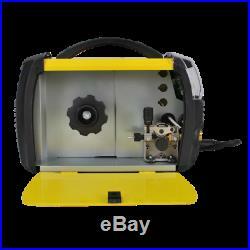 It is intended for all kinds of workshops, locksmith workshops, repair workshops, industrial workshops, factories, etc. The power source has been built on IGBT transistors that ensure minimum electromagnetic interference, low power losses in basic systems, reduce energy consumption, and so on. 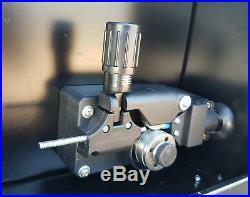 It has the ability to change the polarity of the welding wire holder. Maximum spool with wire: 5 kg. Welding torch with a length of 3 m per Euro coupling. Smooth welding current regulation. 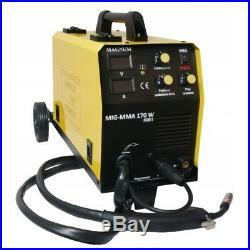 When welding with the MIG-MAG method, you can adjust: welding current, wire feed speed, voltage and wire burn. Wire feeder: 2-roll, with a roll 0.6-0.8 for steel wire. Cooled with a fan. The device allows welding using methods. MIG (in the shield of inert gases – argon / carbon dioxide mix). MAG (in the shield of active gases – carbon dioxide). FCAW (core wire [powder] so-called FLUX). MMA (welding with coated electrode). TIG LIFT / Scratch (TIG welding by rubbing). Power supply: 230V / 50Hz. Welding without gas: Yes. Used reel masses: 1-5kg. MAGNUM MIG 190 II New design. User manual in Polish. Packing and shopping process. Simply leaving negative or neutral feedback can’t solve the problem. We can provide also the invoices without VAT, if you have active European VAT number. We are Polish wholesale of welding, pneumatic and technical products all over the world. Our company data: PEMAT S. Przyjazni 48b/11 41-103, Siemianowice Slaskie, Poland VAT UE: PL6431768329. 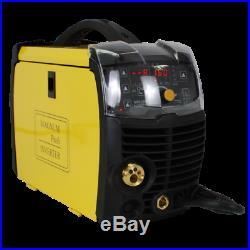 The item “Magnum MIG 190 ARC inverter inverted welder 200A MIG / MAG / MMA / FLUX / TIG” is in sale since Friday, November 2, 2018. This item is in the category “Firma i Przemys\Obróbka metali i lusarstwo\Spawanie i lutowanie\Spawanie\Spawarki i palniki\Spawarki MIG/MAG”. The seller is “pematshop” and is located in Siemianowice Slaskie. This item can be shipped worldwide.